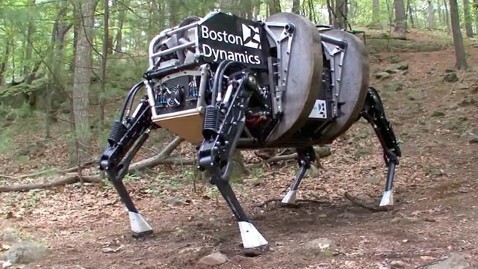 Atlas is a high mobility, humanoid robot designed to negotiate outdoor, rough terrain. Atlas can walk bipedally leaving the upper limbs free to lift, carry, and manipulate the environment. In extremely challenging terrain, Atlas is strong and coordinated enough to climb using hands and feet, to pick its way through congested spaces. Articulated, sensate hands will enable Atlas to use tools designed for human use. Atlas includes 28 hydraulically-actuated degrees of freedom, two hands, arms, legs, feet and a torso. An articulated sensor head includes stereo cameras and a laser range finder. Atlas is powered from an off-board, electric power supply via a flexible tether. Chimp looks like a character from Transformers. At 5ft tall and weighing 443lb, it has a red metal shell, tank-like treads for feet and arms with a three-pronged pincer that can each lift the weight of a smallish man. But it took the robot several minutes to get out of a car and when it tried to open a door, it fell over and broke the frame. The iRobot 710 Kobra is a powerful, rugged, fast robot that supports or carries multiple and heavy payloads while not sacrificing mobility or operation over rough terrain and stairs. Designed with power, agility and flexibility in mind, the iRobot 710 Kobra can lift in excess of 330 pounds, negotiate around and through obstacles and be equipped with numerous payloads to expand your operational area.